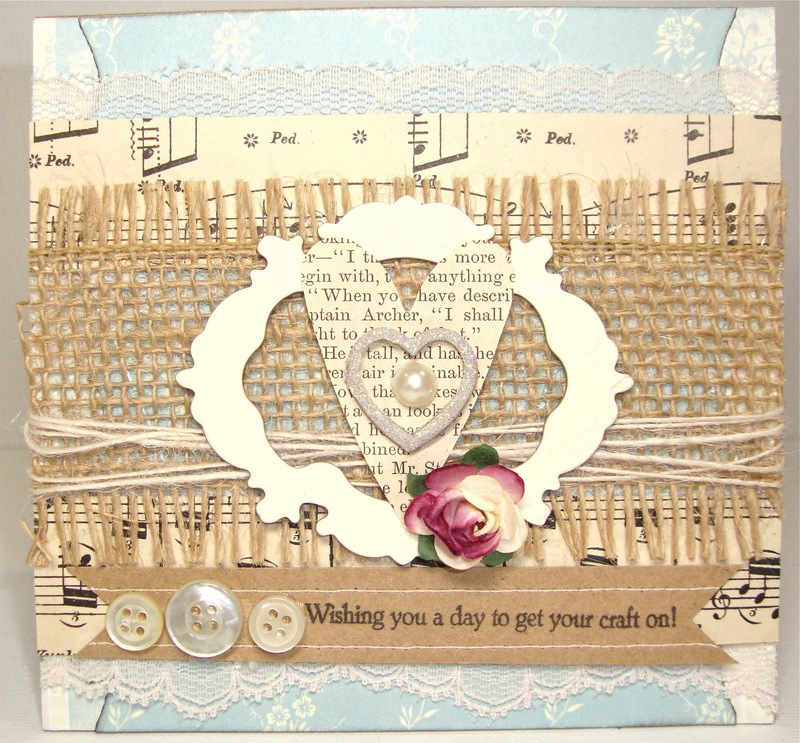 So GENERALLY I do not do a whole of holiday type crafting! 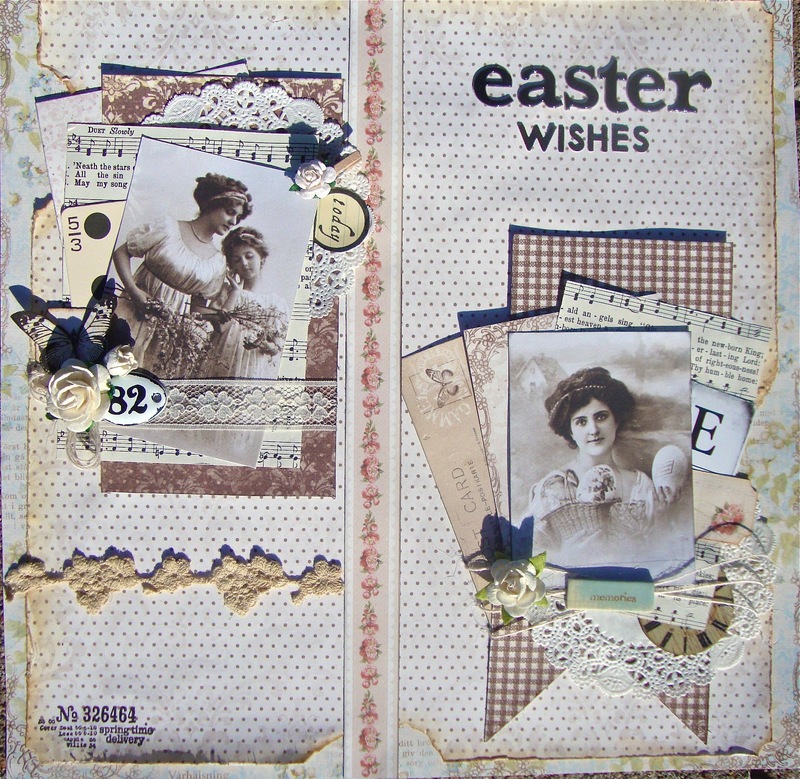 But these PION papers really got me in the Easter crafting mood! 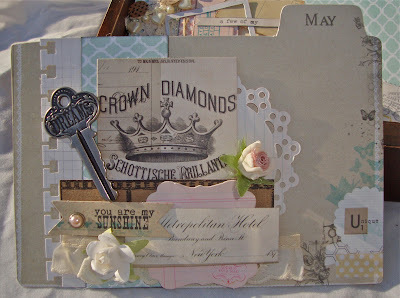 The papers are so delish who could resist I love the vintage eclectic style and I ADORE the vintage emphuera included! 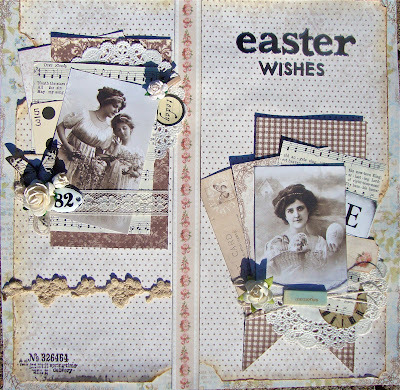 Check out my Easter layout hope you likey! Hey hey hey!! 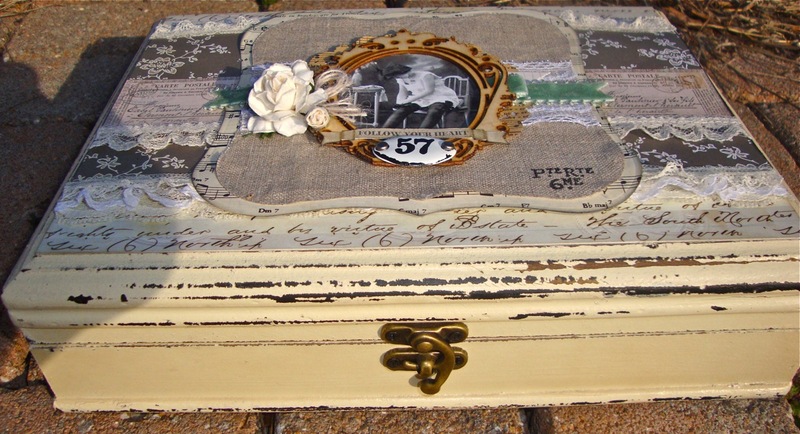 So OBVIOUSLY one of my most favoritest (its a word just roll with it) things to alter is a cigar box!! 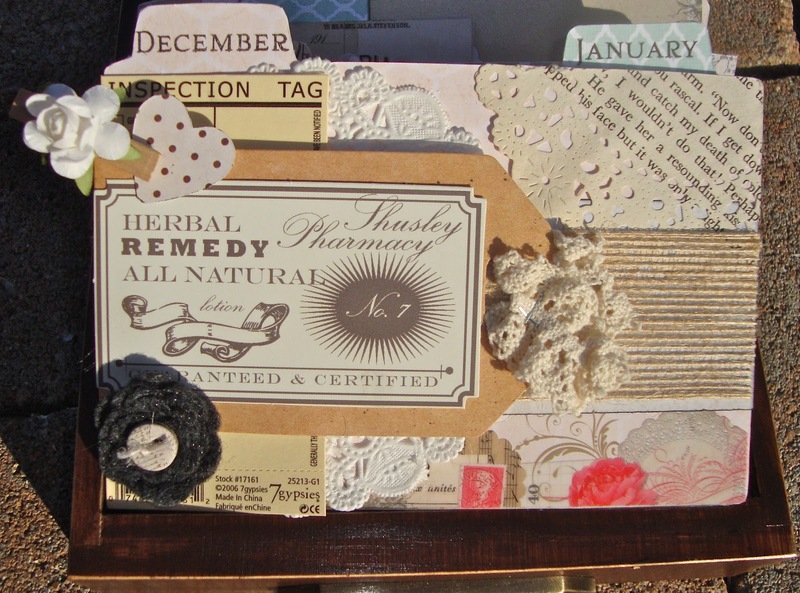 Here is a few pics of one of my most recent altered box. The box is from Hobby Lobby! Check it out! 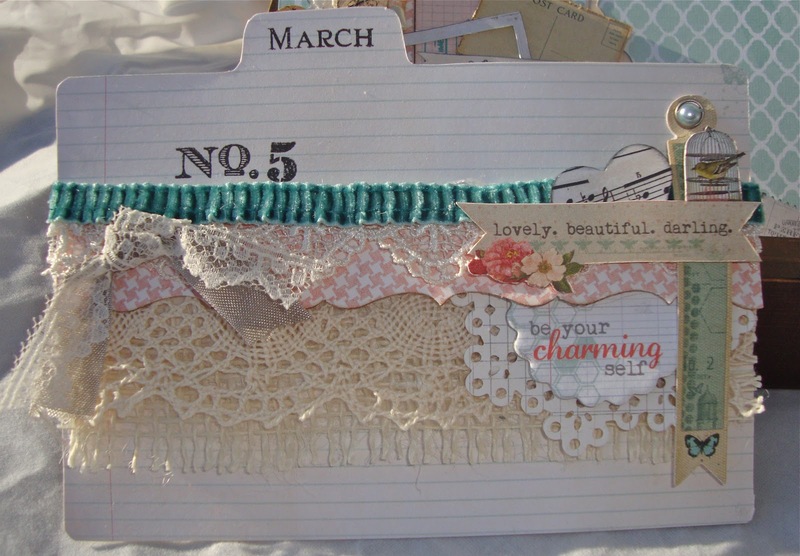 I combined some layers of fabric lace and gorjus Pink Paislee and Prima Papers. 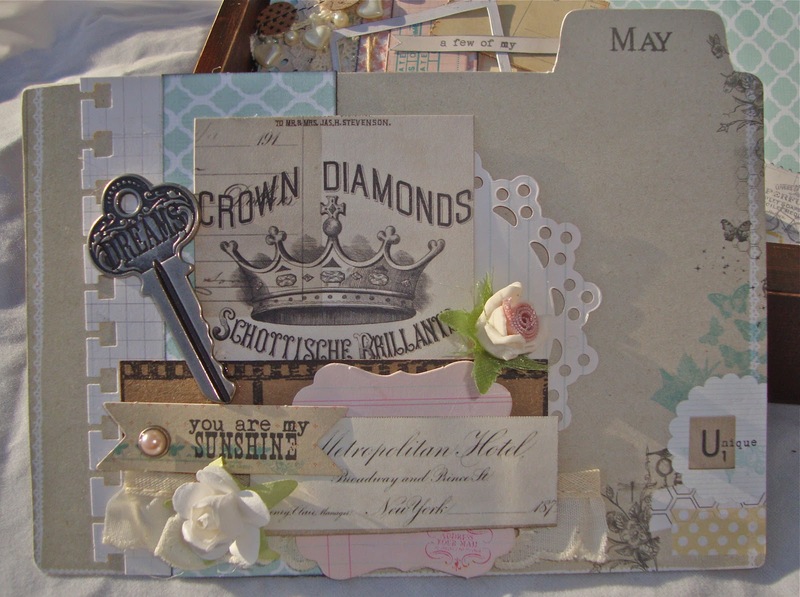 I seriously have a deep affection for velvet trim at the moment! I distressed the box by painting it black and then a creme vanilla - then I stripped the creme paint to reveal the black underneath. Hope you enjoyed the pics! Thanks for stopping by yall!! 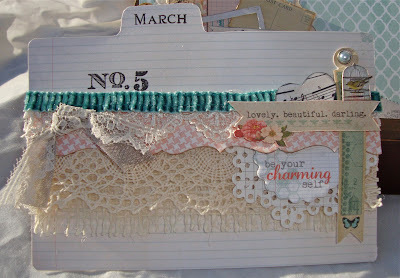 SO are you ready for the second half of the Perpetual Calendar!!! Here goes hope you likey! Lets jump back in with July! Here I used a Cameo image from one of Jenni Bowlin's collection. 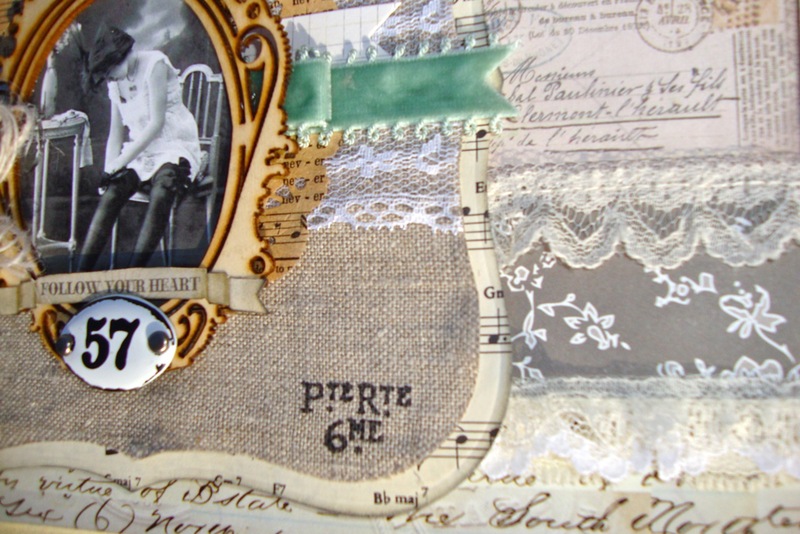 The huge doily in the back ground you guessed it a Papertrey ink die! 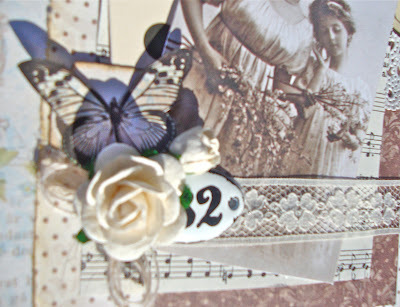 The Black Flower pearl trim is from Karlas001's etsy and then I rounded it all off with some Maya Road kraft tickets. 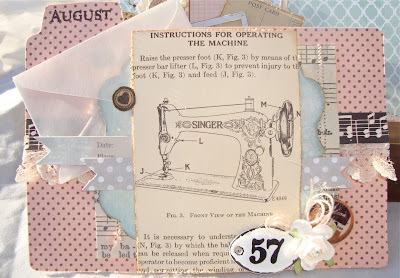 I adore that sewing machine journaling card I snagged from the OA ephemera pack, In the background you'll see a Melissa Frances Top Note Die Cut, the vellum envie is cut from a Papertry ink die. 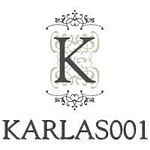 The trim and mulberry flower is from Karlas001. 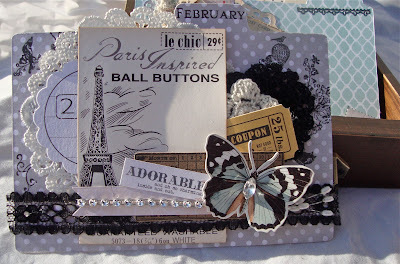 My fav twine is Papertrey ink and then a Tim Holtz number plaque! Love the keyhole trim and the flat back black trim is from Karlas001, the flower is from Michaels I couldn't tell ya who makes it! The doily is just a cup cake doily from Michaels as well. Dressform Kaiser Kraft- def hoard valt worthy! The today tab is from the new Teresa Collins stamp set. The bow and pearl charm is Bluemoon's Madame Daphine and of course the lovely trim is Karlas001! Cut that little heart with a sizzix die. 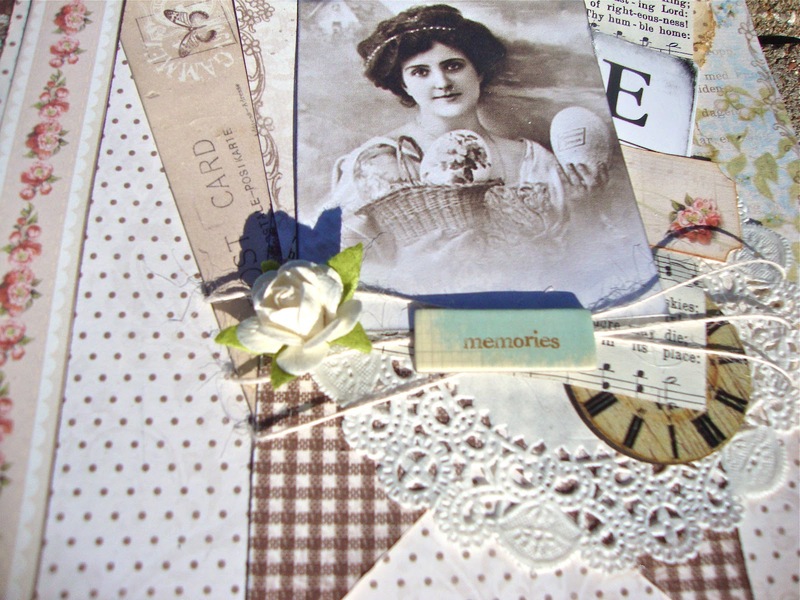 Loving the ephemera piece from Pink Paislee's Vintage Vogue line. 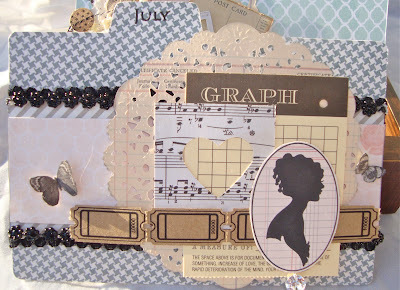 There is that Papertry Ink Twine again I REALLY cannot get enough! 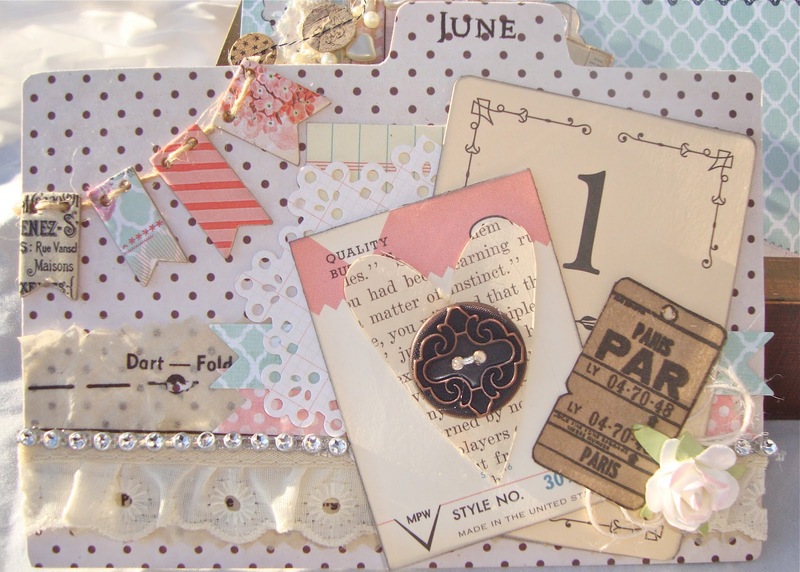 Topping it off with a Tim Holtz button! Check out the Burlap Trim and mulberry flower NOt to mention the tiny clothes pin from Karlas001's etsy, the tag and flower is made by yours truly! In the background there is a 7 gypsies tag! Thank you guys so much for dropping by now that you've gotten an eye full GO MAKE SOMETHING!!! Heart yall! So I do not know about you but I have to tell you I don't have or take very many pictures of myself! I certainly do not scrap myself often at all! And I am sure I am not alone in this! So when there was a sign up for the YouTube Layout Swap hosted by Zoe on Youtube and the theme was "All About Me" I had to take part! 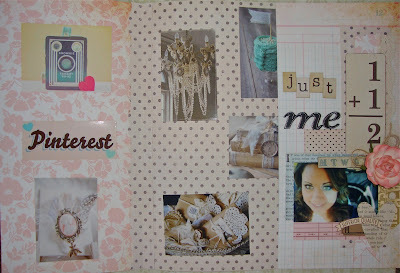 So below you'll see one of the very few layouts of just me!!! 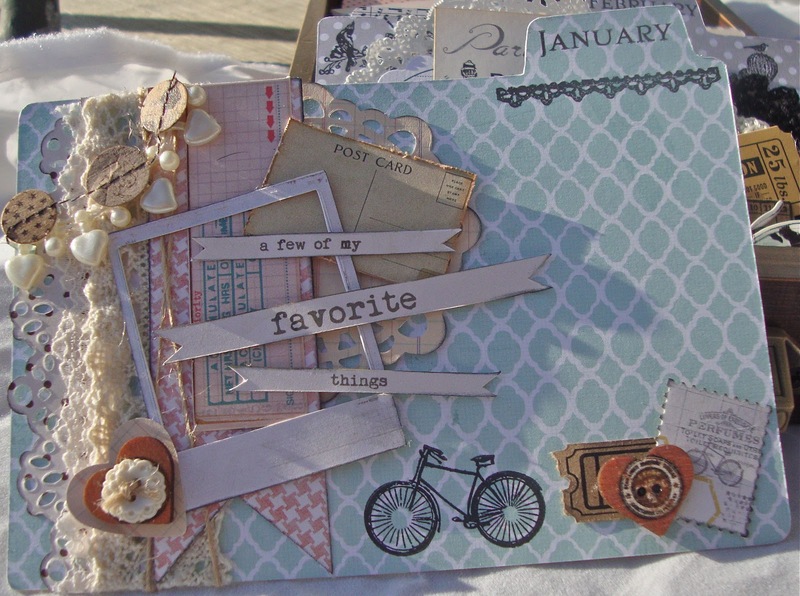 I wanted to def make this a keepsake so I decided to have the layout open to reveal some of the things I am digging right now- Check it Out!! Hope you likey!! Go on go create something!!! XoXo Jade! I happen to adore anything dealing with calendars or notebooks journals ..any type of thing I can make or alter that is USEABLE! My recent creation is just that... Useable. It is a Perpetual Card Calendar. 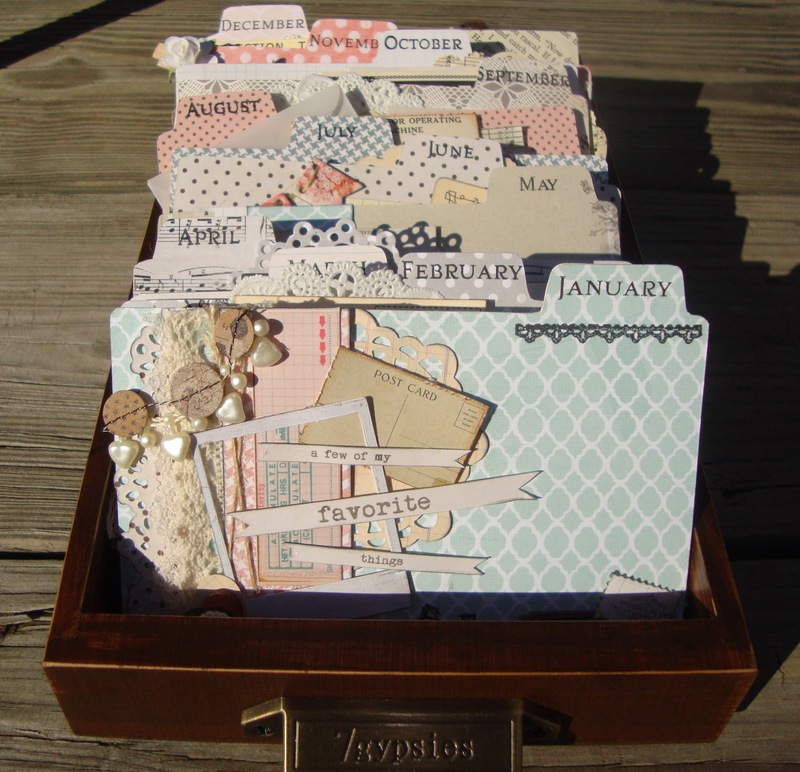 I adore this idea because of course this is a place I can store cards for upcoming birthdays! 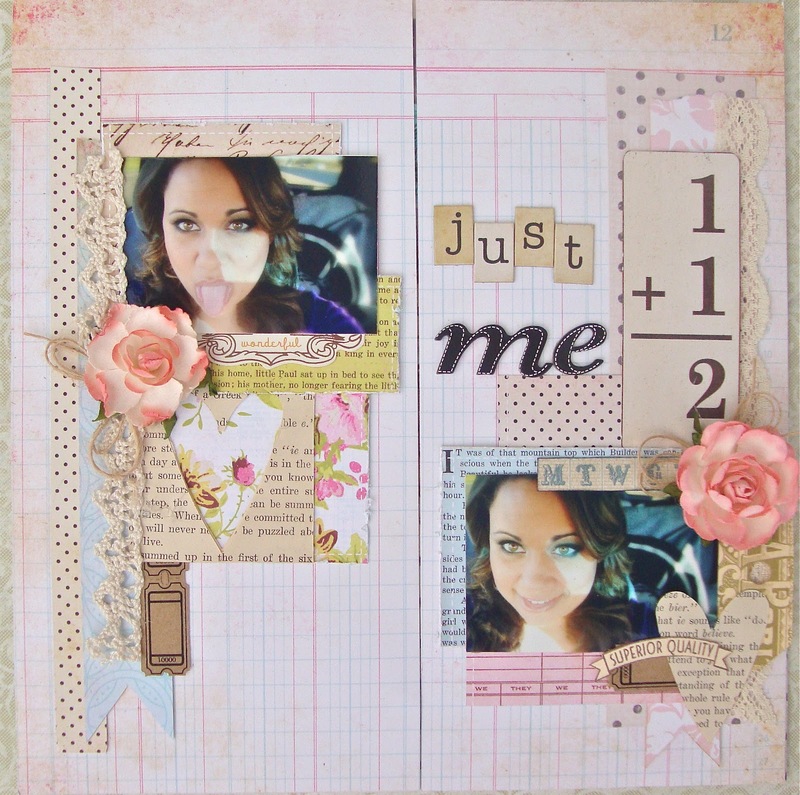 I used a 7 Gypsies Card Catalogue and the My Minds Eye Follow Your Heart, Be Amazing and Be Happy Collections by Rhonna Farrer. (She has a beautiful Mind, wouldn't you agree?). This collection was so perfect for layering yumminess on top of each other..You will also get your eyeful of Karlas001 yumminess throughout the project! Check out the first half! 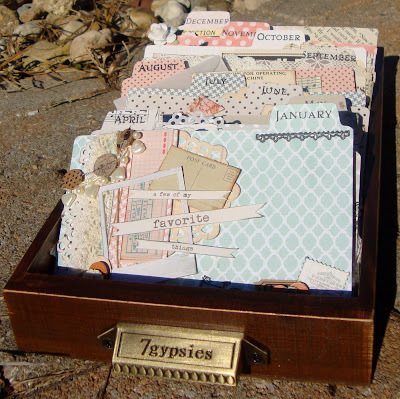 The 7 gypsies tray is the perfect size for stand cards and super long so you can really store some heavily embellished cards! PERFECT! Mucho layers of lace I love my lace girls! 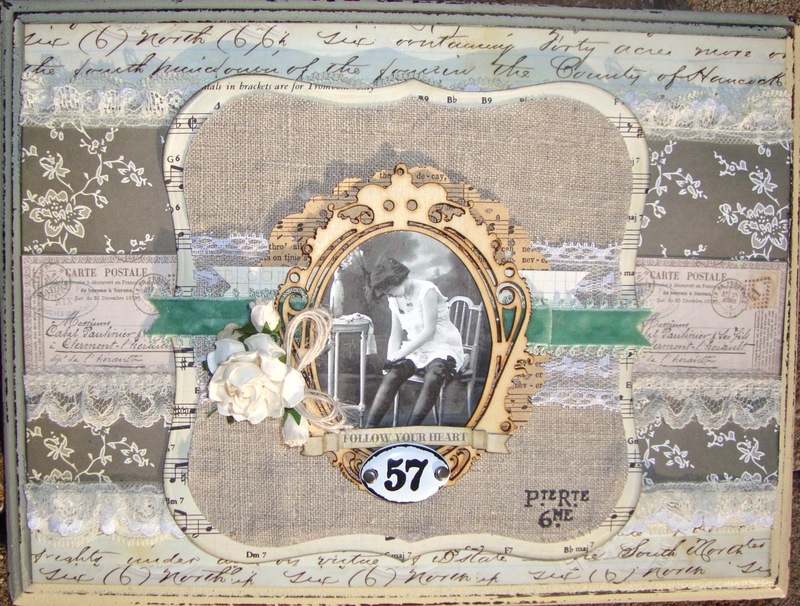 The bottom layer is a natural Burlap Trim from Karlas001! 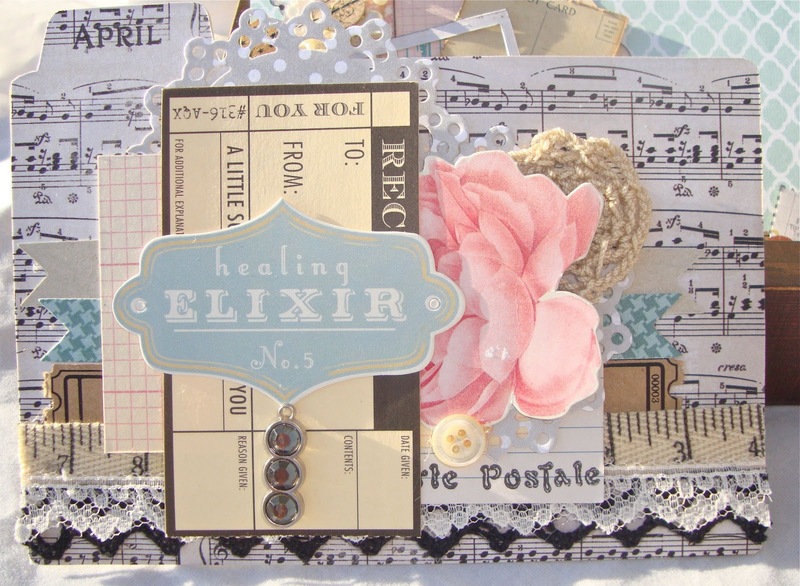 The banner you see in the corner was easy peasy thanks to the chipboard accessory pack from the MME Flow Your Heart Be Happy Collection, Theres that Rina Baling again, And yes the Keyhole Trim from Karlas001 as well, the Button Card is from the October Afternoon Farmhouse Ephemera Pack! As you can tell I didn't hold back on the good stuff!!! Thank you so so much for looking! Go Make something! 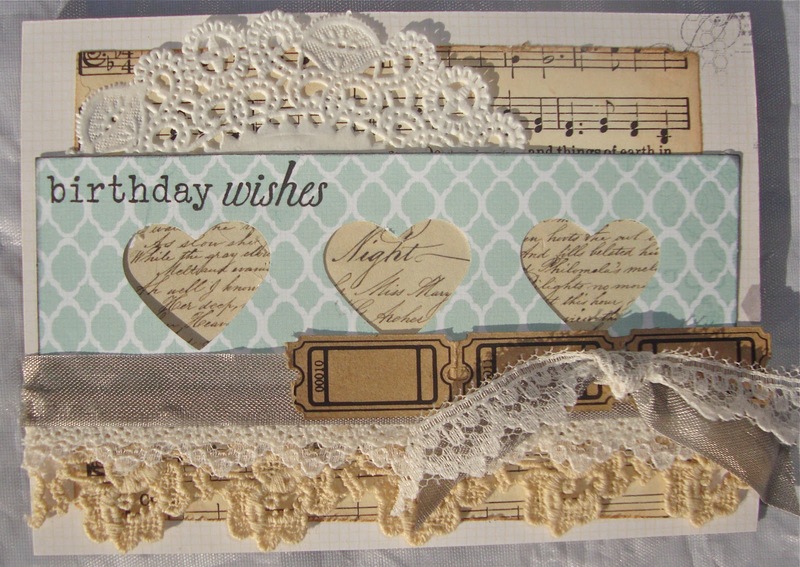 I have become very fond of making cards! 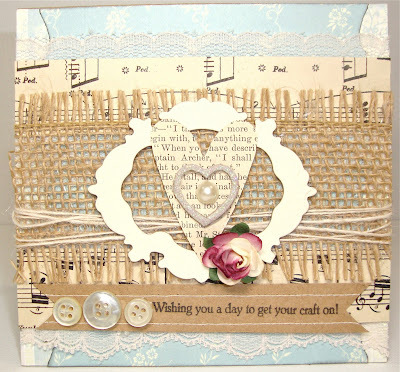 I adore being able to give a handmade card to someone! 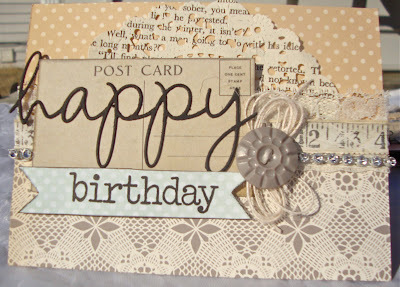 When I have no mojo and do not know what to make I turn to a card because you can always put it up for later!!! 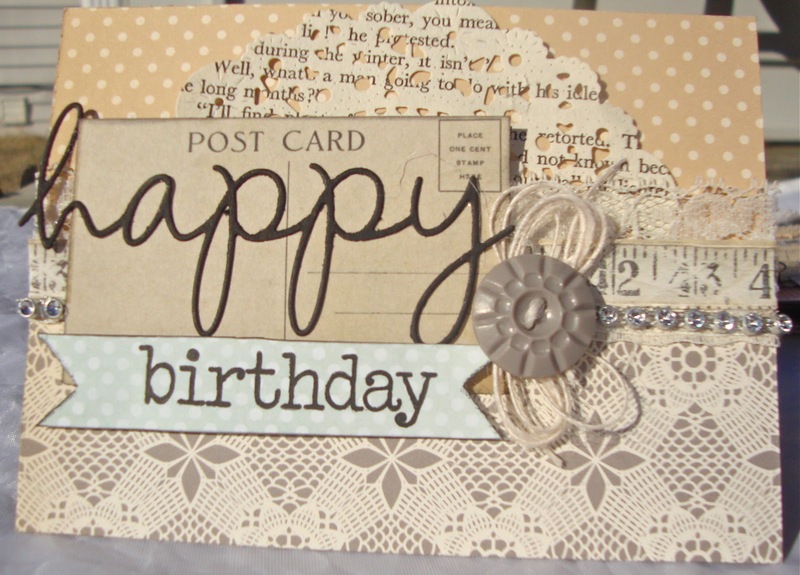 Because REALLY when a friends birthday creeps up on ya ... who has time to make a card!!! Here are a few that will be thrown in my stash for such an occasion ENJOY!!! 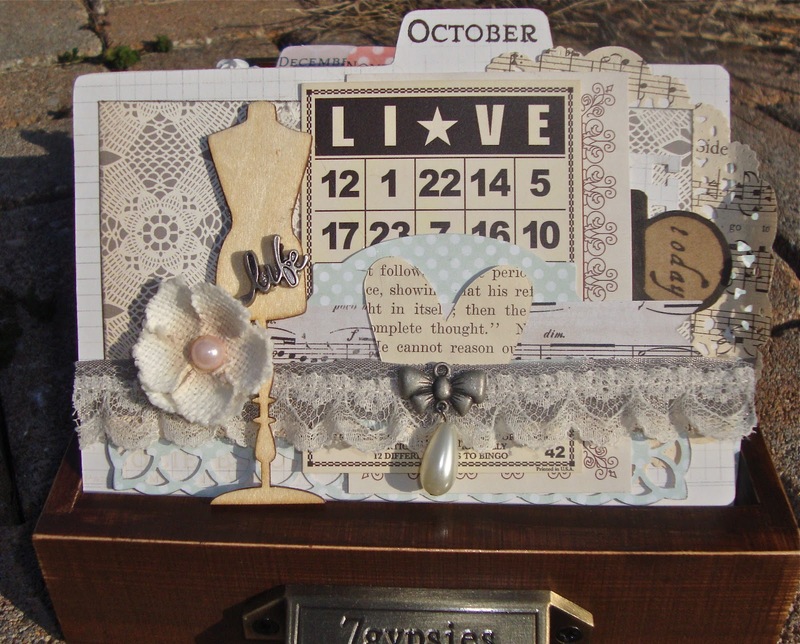 The first a very simple low dimensional card using the October Afternoon Farmhouse Collection And that Doily is a die from PaperTrey ink! Who else is completely OBSESSED with Doilies! 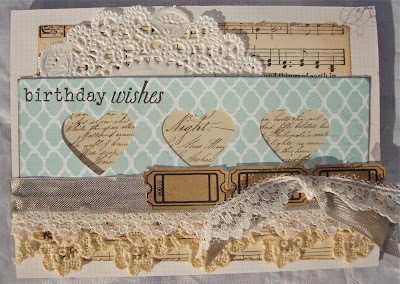 The second is another low dimensional card using the My Minds Eye Be Amazing Collection and loads of lace! 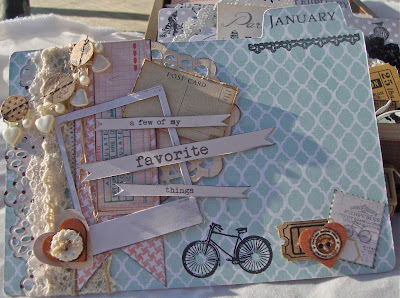 Hope you enjoyed today's share MORE to COME! Go make something!! 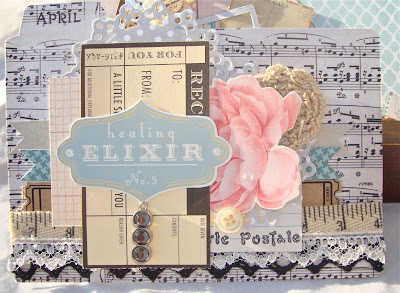 I am also so in love with the organic crafty feel of the card. 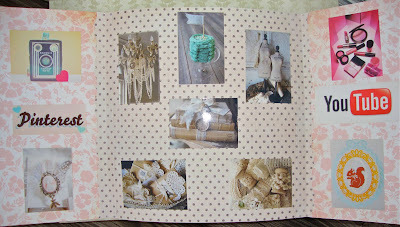 The Burlap strip comes from Karlas001's Etsy shop!!! Thanks for looking! Hello Everyone. I am just a girl with some glitter, a paint brush and some ribbon trying to make a beautiful mark on the world. 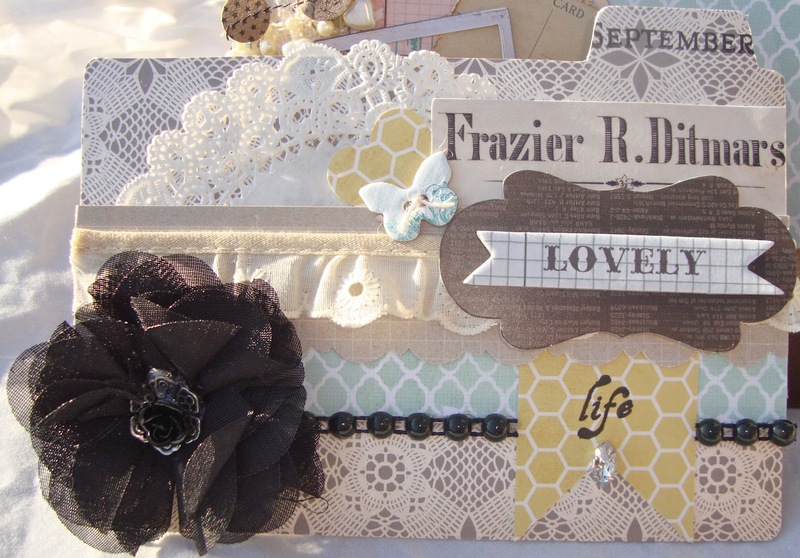 I love creating anything artsy from mini albums to mixed media art works to canvas pieces. So grab your materials and play with me!!! See you Tomorrow at the SA papercaft Fair ? 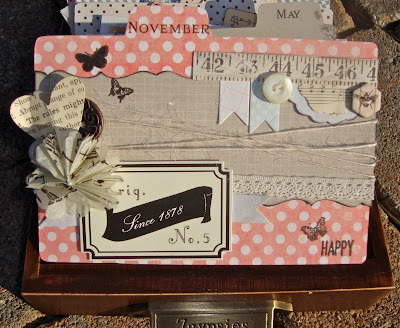 Craft events Knotsgekke kaarten en scrapdagen and Crea Weekend.